(Natural News) Men may enhance their fertility by taking date palm (Phoenix dactylifera L.) pollen. A review published in the Journal of Evidence-Based Complementary & Alternative Medicine found that date palm pollen may help increase sperm count and motility. Date palm pollen is the male reproductive cells of palm flowers. In the review, a team of researchers at Tehran University of Medical Sciences in Tehran, Iran looked at the phytochemistry and pharmacological activities of date palm pollen and its effect on fertility disorders. The research team collected clinical trials evaluating the beneficial effects of date palm pollen in humans, as well as experimental studies assessing the reproductive effects of date palm pollen. Date palm pollen contains compounds such as amino acids, fatty acids, flavonoids, saponins, and estroles. Experimental studies also demonstrated that date palm pollen increases sperm count and motility. In addition, it could improve sperm quality and reduce chemical-induced toxicity on the male reproductive system. Some studies also suggested that date palm pollen has beneficial effects on the female reproductive system as well. Phytochemical studies reported that date palm pollen contains sterol derivatives, flavonoids, and different amino acids, which may be responsible for these pharmacological activities. While date palm pollen may have some beneficial effects on reproductive health, more studies are needed to confirm these benefits. Based on these findings, the researchers concluded that date palm pollen may help enhance fertility, especially in men. Dates are packed with nutrients: Dates contain vitamins and minerals, such as protein, potassium, magnesium, copper, manganese, iron, and vitamin B6. However, since they are mostly dried, they are high in calories like other dried fruits such as raisins and figs. Dates are rich in fiber: In addition to the vitamins and minerals mentioned, dates also contain high amounts of fiber. Consuming fiber-rich foods is good for digestive health as fiber prevents constipation and promotes regular bowel movements. The fiber in dates can also help regulate blood sugar levels. Fiber slows digestion, preventing blood sugar spikes after eating. Dates are rich in antioxidants: Dates also contain high amounts of antioxidants, such as flavonoids, carotenoids, and phenolic acid. Antioxidants protect the cells from harmful free radicals that cause diseases, such as Alzheimer’s disease, cancer, diabetes, and heart disease. Dates may improve brain health: Eating dates may promote brain health by reducing inflammation and preventing plaques from forming in the brain, which is essential for Alzheimer’s disease prevention. 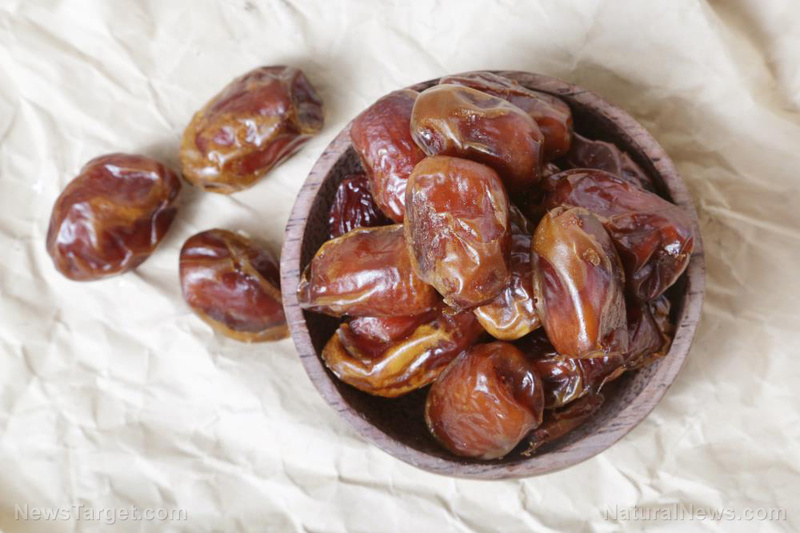 Dates may promote and ease natural labor: Eating dates during the last few weeks of pregnancy may promote and ease natural labor for pregnant women, according to studies. Date palm fruit can be easily added to your diet as they are versatile and delicious. There are many varieties of dates, but they are typically small in size and range in color from bright red to bright yellow. Dates are chewy and have a sweet taste. Dried dates have a wrinkled skin, while fresh dates have a smooth skin. They are often consumed with other foods like almonds, nut butter, or soft cheese. Read more news stories and studies on natural medicines like date palm pollen by going to NaturalMedicine.news.